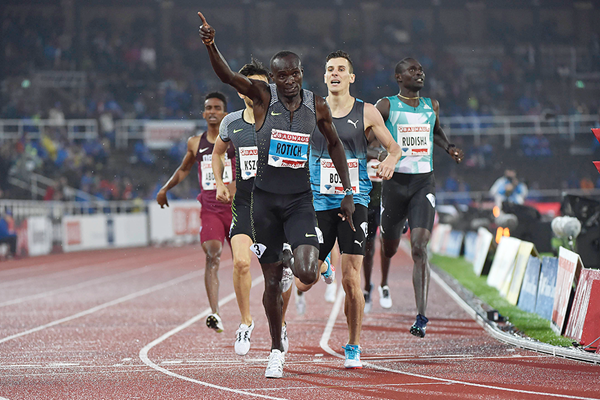 It was Rudisha who took the lead after the first lap, leading until the back straight when he was challenged by Ambrose. Rudisha fought gamely to keep his lead until the final straight when he was passed by three runners. Cheruiyot turned on the after-burners in the last 50 metres and outpaced them all to win his second diamond league race. The win leaves Cheruiyot as a candidate for a medal in this event at the Rio Olympics. Rudisha struggled but then again he always seems to struggle in rainy conditions. His form is OK judging by how he wan the 600m race at Birmingham. This entry was posted in Kenya Athletics News, Kenya Sports news and commentary and tagged david rudisha, Ferguson Cheruiyot. Bookmark the permalink.